The end of year is quickly approaching, and we have a bunch of activities and events coming up. We have just 2 regular club nights left - May 6th and May 13th. As a result, we do need permission slips (attached) as soon as possible for the activities that are coming up. A reminder that we rely on parents to assist during the club nights, particularly as we are split between the club-house and the gym. There have been occasions where parents have not attended nor swapped with another parent, resulting in having to restrict the club to either the gym or clubhouse. We will be having a presentation of trophies for the sports competition winners by Superintendent Enda Walshe at 9pm sharp at the club. Also, we will need to get permissions slips for the Foróige Sports Day on May 14th so that the bus(es) can be organized. The final regular club night of the year, and we will need permission slips for the end-of-year district disco and end-of-year club outing. East Galway District Foróige Fun Sports day at Shiveen Rovers FC in Newbridge. The day runs from 10:30am to about 6pm, bus(es) will depart Loughrea at 9:30am, returning at about 7/7:30pm. The club will pay the entry fee for the teams, the only cost is the price of the bus - €5 per member. East Galway District Foroige end-of-year social event in New Inn. Bus(es) will depart from the temperance hall at 8:15pm, returning at about 12:45am. The district covers the cost of the event, the cost to members is €5 for the bus. Club end-of-year outing to City Limits in Oranmore. Details of times to be confirmed. The member cost is €10, with the remainder covered from club funds. 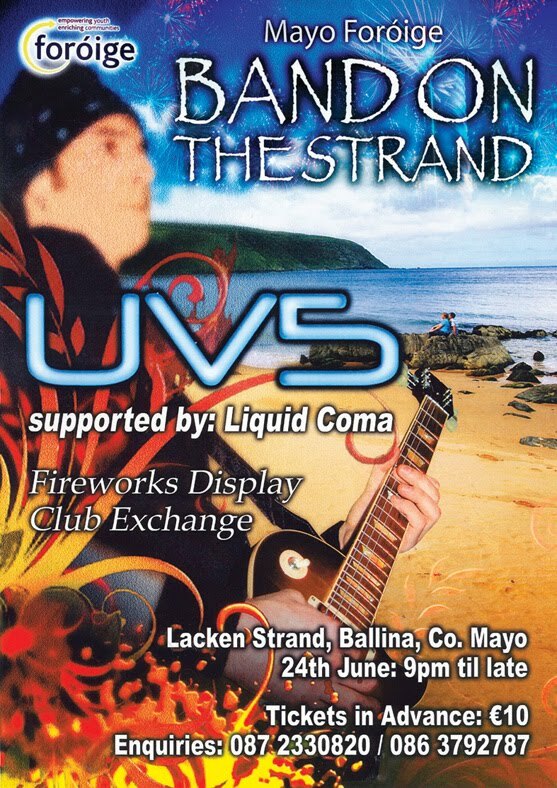 Bands on the Strand on Lacken Strand, Ballina, Co. Mayo. This is a long but enjoyable event that the club attended last year. We will discuss with the members over the next few weeks.